September 17th, 2013 (Tokyo, Japan) -- Wacom Co., Ltd., today announced that Samsung Electronics Co., Ltd has adopted Wacom feel IT technologies (branded feel™) for their new smart phones – the “GALAXY Note 3” and the “GALAXY Note 10.1 (2014 Edition)”. These latest smart phones use Wacom’s advanced digital pen sensor system, optimized to deliver a more creative user experience over a wide range of mobile devices. Wacom’s feel™ technologies power the S Pen in Samsung’s devices. Wacom is delighted to be supporting our leading industry partners in making the world a more creative place with our next-generation digital pen sensor systems. In 2011, the GALAXY Note was the first smartphone to incorporate Wacom’s feel™ technologies. This was followed by the GALAXY Note 10.1, the GALAXY Note II, the ATIV Tab 7 and Tab 5 (all launched in 2012), the GALAXY Note 8.0 (February 2013), and the ATIV Tab 3 (June 2013.) Building on years of close collaboration between the two companies, the GALAXY Note 3 (with 5.7 inch screen) and the GALAXY Note 10.1 (with 10.1 inch screen) are the eighth and ninth products respectively by Samsung, to use Wacom feel™ to improve the user experience. The advanced S Pen with feel™ reinvents and modernizes classic note-taking, playing an integral role in how users interact with devices and making daily routines easier and more efficient. For example, a simple click of the S Pen button while hovering over the screen introduces users to “Air Command”, a set of five features which make tasks quicker and easier. Among the features of Air Command, “Action Memo” allows users to handwrite a note, convert handwritten information into formatted content or automatically execute a function. Action Memo also lets users quickly initiate a call, add to contacts, look up an address on a map, search the web, or save a task to a to-do list. “Pen Window,” another feature of Air Command, allows users to use the S Pen not only for drawing sketches or writing notes, but also for opening a small application window for multitasking. Simply draw a window of any size, anywhere on the screen, and users can easily and quickly open another window for applications such as YouTube, Calculator or Browser without pausing current activity on the screen. To make these features possible and create a natural, intuitive, user experience, Wacom feel IT technologies integrates a high performance digital pen and a single chip controller into the GALAXY Note 3 and GALAXY Note 10.1 (2014 Edition). By promoting the adoption of feel™ in a variety of mobile devices, Wacom strives to make using technology more intuitive, more fun and more creative. Founded in 1983, Wacom is a global company based in Japan with subsidiaries and affiliate offices around the world to support marketing and distribution in over 150 countries. It is the world’s leading manufacturer of pen tablets, interactive pen displays, and digital interface solutions. The advanced technology of Wacom’s intuitive input devices has been used to create some of the most exciting digital art, films, special effects, fashion and designs around the world and provides business and home users with their leading interface technology to express their personality. Wacom also supports designers and creators by organizing/participating in various activities to nurture new talents. The company also offers its products as OEM solutions to leading manufacturers serving incremental markets. Wacom’s interface technology, called Wacom Feel IT technologies, is also offered as an integrated solution to strategic partners. Most Tablet PC manufacturers count on the advanced features and reliability of the brand to deliver a superior user interface experience. *Wacom, feel are trademarks and/or registered trademarks of Wacom Co., Ltd.
*All other trademarks and product names are property of their respective companies. Berlin, Germany - September 4, 2013 - Samsung Electronics Co., Ltd., a global leader in digital media and convergence technologies, today unveiled the GALAXY Note 10.1, 2014 Edition, an original approach to balancing productivity, powerful content creation and consumption in one portable tablet device. Equipped with WQXGA Super clear LCD (2560x1600) resolution in a stunning 10-inch display, 1.9 GHZ Octa Core processor (for 3G / WiFi only version) and 3GB RAM, the GALAXY Note 10.1 (2014 Edition) demonstrates Samsung’s innovation leadership by delivering ultimate productivity capabilities while remaining extremely thin and light. 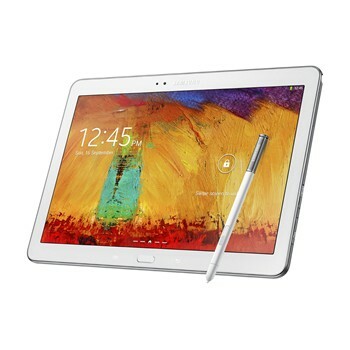 The new GALAXY Note 10.1 expands on the advanced productivity and creativity leadership delivered by the original Samsung GALAXY Note 10.1. In addition to enabling productivity, the device has been redesigned with a sleek, light, slim frame that is both fashionable and portable. The large, bright and crystal clear screen delivers four times the pixel density of the original GALAXY Note 10.1, providing a premium content viewing experience. The magazine style UX allows users to organize their favorite resources in an easy to use dashboard and then access that content for a stylish reading experience. Whether watching videos or reading magazines and e-books, the new GALAXY Note 10.1 provides an immersive media consumption experience. New design characteristics, like a warm and textured back cover with stitching, inspire a sense of elegance and sophistication. The device’s screen size also enables enhanced multitasking. With Multi Window, users will be able to run separate instances of the same application, and use an enhanced S Pen to drag and drop content from one window to another. Pen Window enables users to simply draw a window of any size on the screen, and instantly access unique in-application features such as YouTube or calculator. The updated S Pen included with GALAXY Note 10.1 improves responsiveness, delivers day-to-day efficiency enhancements and produces more creative input capabilities. The tablet also includes GALAXY Note 3's updated S Pen features such as Action Memo, Scrapbook, Screen Write and S Finder. Combined with the tablet’s larger screen, these enhanced S Pen capabilities present users with unique creative opportunities and the space to explore them. With new Scrapbook capabilities, users can easily indicate any interesting content with the S Pen and organize it into individualized scrapbooks, creating a log of discussion points for a future work conversation, a wish list for new clothes or a home redesign project, or a personal favorites list. S Note has been upgraded with a more intuitive, easy-to-use interface. Users will have access to both note files and notepads, with the ability to use the S Pen to take handwritten notes. With Easy Chart, hand-drawn visualizations of data can be instantly transformed into more formal charts and graphs. The new GALAXY Note 10.1 will also offer a host of exciting partner content that complements the device’s entertainment, productivity and creativity properties. With premium partner applications and free memberships and services, the new GALAXY Note 10.1 provides everything a user might need in one place. The Samsung Content Gifts include content from leading news sources such as Bloomberg Businessweek＋, The New York Times, Autodesk Sketchbook for GALAXY for painting and sketching, a redesigned version of social broadcast network Twitter optimized for the device, and much more. In addition, the GALAXY Note 10.1 (2014 Edition) will also include a Samsung Apps widget that will direct users to additional beneficial content provided by Samsung. The widget will live on the home screen and include a “Special Offer for GALAXY” section that will highlight unique, country-based content for users. The GALAXY Note 10.1 (2014 Edition) will come in three connectivity options: WiFi Only, WiFi and 3G, WiFi and LTE, available in 16/32/64GB ＋ Micro SD. Comes with two color options, Jet Black and Classic White, the GALAXY Note 10.1 (2014 Edition) will be offered globally and will be available starting from Q3, 2013. The selection of AP will be different by markets.